When it comes to being an entrepreneur, startup cash is always a good thing. That’s why you should come to AlleyNYC on October 8th and let EFactor host you at Pitch it in Person. One lucky entrepreneur will walk away with $2500 in startup cash. Do you want to be in the running and try your hand at pitching? To be considered, submit your executive summary to yanna@EFactor.com by Thursday, October 3rd, 2013. 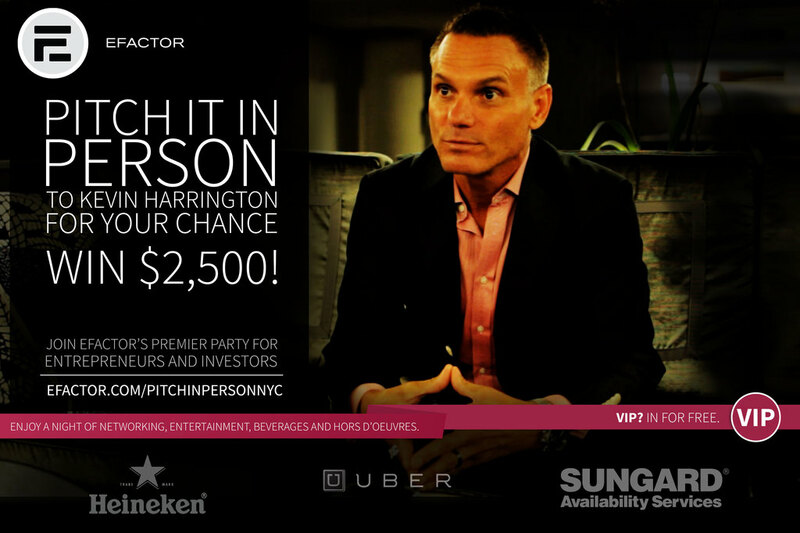 EFactor staff will review all submissions and select five entrepreneurs who will deliver a 5 Minute pitch to product mogul Kevin Harrington, who will judge each one and select a winner. Want to know what you’re up against – besides the other startups, of course? Harrington is an expert when it comes to product launches, having launched over 500 products himself, resulting in sales of over $4 billion. He launched the Home Shopping Network Direct and is considered the Infomercial King. Remember that kitty litter box that’s going to absolutely change your life – never mind you don’t own a cat – that you saw on television at 3 am during another sleepless night in startup land? You guessed it: Kevin Harrington was behind that one. It’s safe to say he knows a thing or two about how to turn a business idea into a million dollar product. We’re willing to bet he also knows a thing or two about sleepless nights. “Kevin knows a good opportunity when he sees one and recommends EFactor to any entrepreneur who needs a Wingman,” says Michelle Fetsch, Marketing Director of EFactor, the social network that boasts the world’s largest entrepreneurial community. With one million members in 222 countries across 240 industries, EFactor aims to provide its members with the people, tools, marketing and expertise to succeed and make real, trustworthy and lasting business connections. At its core is a strong algorithm that connects not just a lot of people, but the right people to help advance your business idea. It provides tools that facilitate your preparations for funding, and provides resources to help reduce business costs; these services are delivered through a unique mix of online social networking and offline domestic and international events. You don’t have to pitch to participate in Tuesday’s event. All are welcome to apply, attend, network and participate in an opportunity to hear from a successful serial entrepreneur. Remember- someone will walk away a winner, but first you have to be able to navigate Shark-infested waters. Editor’s note: For the opportunity to pitch your idea, submit your executive summary to yanna@EFactor.com by Thursday, October 3rd. Be sure to use your AlleyWatch 50% off discount code, AW-EF-3165, when registering for the event.